The OWASP Top 10 Vulnerabilities, last published in 2013, has been a valuable list of criteria by which any Web Application Firewall (WAF) is evaluated, but has a glaring flaw, it only focuses on vulnerabilities in the code, and ignores automated threats. 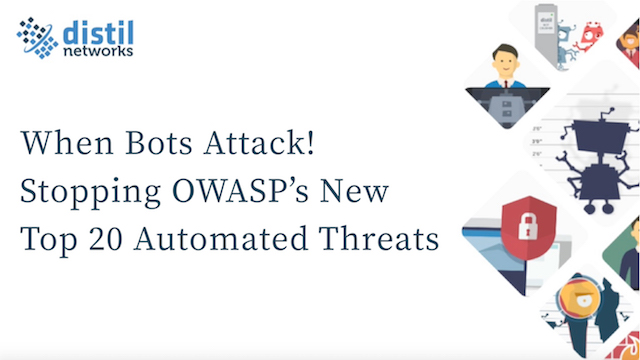 In late 2015, this flaw was addressed and OWASP released the first Automated Threat Handbook specifically to help organizations better understand and respond to the notable worldwide increase of automated threats from bots. This presentation discusses these new bot threats, bot evolution, and how to fight back. Many posit that cloud architectures/business models will bring about a more patient, gradual availability model, where failures are either rendered unimportant because of mass replication or load shifting, or they are tolerated in exchange for cheaper services. Whatever the long term promise, the fact is that outages and performance degradation continue to dog the industry. According to the 2017 Uptime Institute Survey, 92% of management are more concerned about outages than one year ago. As your website, mobile app, and the APIs that power them become more distributed, failures resonate outward and have an ever-greater impact on your business. You no longer can just worry about your own on-premise and cloud infrastructure, but must also be aware of your company’s third party SaaS vendors and THEIR infrastructure too. Watch Andy Lawrence, Vice President at 451 Research, Engin Akyol, CTO of Distil Networks, and Scott Hilton, VP & GM Product Development of Oracle Dyn for a thought-provoking conversation about next-generation website resiliency. Forward thinking brands understand the importance of IT and business working together to solve the bad bot problem. Join a lively conversation with leaders from Build.com, SiteSpect, and Distil Networks to learn actionable ways to increase online revenue. Blocking bad bots isn’t just the purview of the IT department. When nefarious competitors, hackers and fraudsters use bots for competitive intelligence, account takeover, and fraud, they also skew web analytics, and place a drag on marketing KPIs and the customer experience. The notion of API management in which enterprise architects, app developers and IT security experts work in harmony is great in theory. The reality, according to new research from Ovum, is much more scattered. Watch Ovum IT Security Analyst Rik Turner as he dives into new primary research on how companies are really managing API security. Then watch the lively conversation as Rami Essaid, CEO of Distil Networks, explains why APIs are becoming such an increasingly attractive target for hackers. Lastly, Shane Ward, Senior Director of Technology at GuideStar, will share best practices and pitfalls to avoid when managing both free and paid access to your APIs. Learn the profile of a modern spammer, why they target a site like Drupal.org, and why the anti-spam measures of the past are no longer sufficient. We'll walk you through Distil Networks unique approach to identifying bots and bad actors, and how we implemented this on Drupal.org. Finally, we'll explain how other large scale Drupal sites can use similar techniques to protect themselves. Distil Networks has produced their fourth annual Bad Bot Report. It's the IT Security Industry's most in-depth analysis on the sources, types, and sophistication levels of 2016’s bot attacks -- and there are serious implications for anyone responsible for securing websites and APIs. Register today to gain actionable insights on how to defend your websites and APIs for the coming year of automated threats. Register today to gain actionable insights on how to defend your websites and APIs for the coming year’s onslaught of automated threats. Bonus: All registrants will receive a copy of Distil Networks 2017 Bad Bot Landscape Report, presentation slides, and a copy of the EMA White Paper: Bot Defense: Insights Into Basic and Advanced Techniques for Thwarting Automated Threats (a $99 value). Malicious bots, or what OWASP calls Automated Threats, are more sophisticated than ever and fast becoming the biggest threat to web application security. Join Tin Zaw, Director of Security Solutions at Verizon Digital Media Services and Edward Roberts, Director of Product Marketing at Distil Networks, for a lively conversation about the new automated threat and how enterprises can protect themselves with a proactive and layered approach to web application security and performance. Did you know 30% of travel industry website visitors are unsavory competitors, hackers, spammers, and fraudsters? Worse yet, unwanted traffic from web-scraping bots can negatively impact revenue management targets and yields across multiple distribution channels. Join Anthony Drury, Director, Head of Business, at easyJet, as he takes you through his strategy to ensure easyJet customers -- wherever they are booking -- get price and availability content through approved API channels. The approach of easyJet ensures that all bookings are screened for fraudulent activity and blocks are added to restrict screen scraping. The digital advertising marketplace is under sustained attack from increasingly sophisticated Non Human Traffic (NHT) (aka Bots) that divert, steal, and defraud billions of dollars a year. According to a new study by The 614 Group, 78% of digital publishers identify NHT post campaign, and 39% proactively block it outright--just one of many revelations collected from surveying over forty digital publishers’ about their daily battle to combat digital ad fraud. Watch our discussion led by The 614 Group and Distil Networks with commentary from industry luminaries. Automated threats are bad bots and are being used by hackers and fraudsters to exploit your web applications. Whether it's account takeovers, unauthorized vulnerability scan, testing stolen credit cards, DDoS attacks bringing down your site, bots are being leveraged by the bad guys to attack you at scale. Brian Gress is Director of IT Systems & Governance at Hayneedle where he leads the network and infrastructure, IT security and compliance, quality assurance, and change management functions and teams. Mr. Gress holds undergraduate and graduate degrees in information systems, is a certified chief information security officer and auditor, as well as a licensed PCI internal security assessor. Mr. Gress also spent several years teaching as an adjunct professor at the University of Nebraska College of Information, Science and Technology. Attend this webinar for what promises to be a spirited web application security conversation between Eric Ogren, Senior Security Analyst at 451 Research, and Rami Essaid, CEO of Distil Networks. Web scraping - the process of using bots to systematically lift content from a website - is either loved or hated. Startups love it because it’s a cheap and powerful way to gather data without the need for partnerships. Large companies use web scraping to gain competitive intelligence, but try to block others from doing the same. However, new legislation and high profile court cases have called into question the legality of web scraping. In this lively conversation, diverse panelists will discuss the origin of web scraping, the changing legal landscape, and the legal and technical best practices for protecting your website content. Chris Nelson has a passion for security, especially building security programs and teams in incredibly dynamic organizations. Chris is currently the Vice President of ISSA’s Denver Chapter, and Director of Security for Distil Networks, where he continues to expand his theories on using Permaculture in the design and implementation of security programs and controls. Chris held a similar role at Rally Software after working with Aetna as a security, compliance and privacy lead. Previously, he held similar roles with Return Path and has served multiple Fortune 500 clients in a consulting capacity. For many of today’s businesses, web applications are their lifeline. The growing complexity involved in keeping these applications fast, secure, and available can be seen as a byproduct of shifts in how these apps are developed, deployed, and attacked. This discussion will explore how high level trends in today’s web environments and the cyber attack landscape are shaping tomorrow’s application security solutions. To help travel technologists and marketers better understand the keys to web security, Skift and Distil Networks hosted this webinar. Like most ecommerce sites, StubHub’s competitors try to scrape their prices, and monitor inventory and customer behavior. Meanwhile, other nefarious actors attempt brute force attacks and transaction fraud. Learn advanced website security and web infrastructure management strategies from StubHub, the world’s largest ticket marketplace, and Distil Networks, the global leader in bot detection and mitigation. Distil Networks, the global leader in bot detection and mitigation, offers the most automated and accurate way to identify and police malicious website traffic, blocking 99.9% of bad bots without impacting legitimate users. Distil protects against web scraping, competitive data mining, account hijacking, form spam and click fraud while slashing the high tax that bots place on your internal teams and web infrastructure.